Get the exact size and shape you want with a custom artificial boxwood bush from Artificial Plants Unlimited. 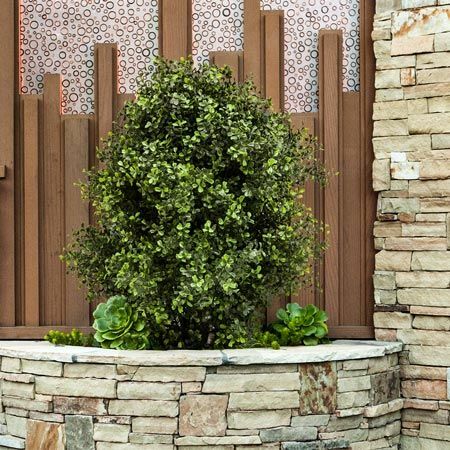 Nothing compares to a tailor-made solution and our replica expertise yields outdoor artificial bushes at the pinnacle of realism and performance. Adding outdoor artificial boxwood bushes is a long-term investment in curb appeal for residential yards, apartment complexes, condominiums, retail plazas, and more. And because they're maintenance-free, custom faux shrubs are an ideal alternative that sidesteps pruning, watering and expensive gardening services. Wherever lifelike shrubbery is desired, outdoor artificial boxwood bushes do the trick in vibrant fashion. The time for outdoor artificial bushes is now. Never before have faux boxwood plants looked so lifelike. And integrated UV-resistance and weather tolerance ensures a product that performs at the highest level. In fact, our outdoor artificial boxwood shrubs are so convincing, you've probably already seen them around more than you know. As some of the hardiest shrubbery out there, boxwood graces residential and commercial exteriors from coast to coast. Our artificial bushes online have all the same characteristics property owners love: supple foliage, rich green coloration and an affinity for providing functional coverage. The only part we left out is the maintenance. Maintenance-free fake bushes for real landscape improvements. A high-end artificial boxwood bush is as good as real and, when it comes to utility, even better. Fake shrubs come ready for a range of beautiful displays including ground and container applications. Use in conjunction with landscape features like landings, stone walls and outdoor partitions to delineate space, improve coverage or simply add decoration. Also, fake boxwood plants are fully customizable so residential landscape designers and commercial project planners get the exact size and shape a project calls for. Replica greenery can help to save on long-term gardening costs and overcome live growing challenges like poor soil composition and bad exposure. Looking for custom sizes and shapes? Artificial Plants Unlimited works with various clients including residential and commercial design professionals to create faux shrubbery that meets specific project goals. Our experienced project managers can also recommend commercial planting containers for readymade fake shrub displays. Great for restaurants, retail stores, commercial plazas, hotels, and so much more. Ready to start your custom outdoor artificial boxwood design? Please call toll free for more information and to receive a no-obligation quote.